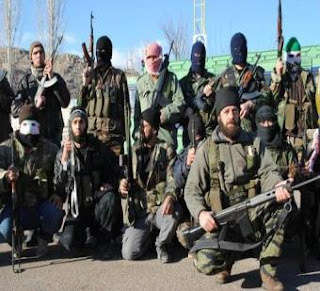 Proxy Wars: Could the U.S. end up supporting al-Qaeda-like groups in Syria? For the second time in several months, Russia and China have vetoed a UNSC resolution concerning Syria. The double veto last Saturday especially irritated U.S. and European leaders because they thought that the Arab League’s proposal was revised several times to meet Russia’s demands. Russia argued that Western states rushed the vote, despite its request to wait until after its diplomatic envoys had visited Damascus on Tuesday. Both West governments and Russia have reasons to maintain this bizarre diplomatic face-off, but the true reasons are not necessarily the stated ones. Russia’s position must be understood in the context of its internal and regional geopolitics. The same can be said about the Arab League’s proposal, which called on Assad to step down. Recent history, too, plays a major role in this clash between Russia and the U.S., a replay of the Cold War Era rhetoric. Importantly, the Russian leadership may face unrest this March if the scheduled elections returned Putin to the presidency and if the opposition forces would find evidence of fraud that would force them to reject the results. The U.S. has already gone on record supporting Russian protesters. Russia does not want the Arab Spring exported to its streets, and they believe that saving the Syrian regime will be a test of their ability to manage similar crises at home and abroad. The uprising in Syria is significant for Saudi Arabia, a country eager to weaken Iran. For this reason, Saudi Arabia, as well as Qatar, key two countries that are now controlling the Arab League, took leading roles in shaping the political and military aspects of this crisis. The Gulf States’ media coverage of the Syrian crisis has failed to refer to violent armed groups. Russia, on the other hand, continues to insist that armed groups should take the blame for the increased violence. Syrian state-controlled media blames most of the deaths on armed groups (which it calls terrorists). Independent journalists, most recently a crew from a Lebanese news outlet—al-Akhbar, described several border towns as being militarized “forward bases.” The Syrian uprising, initially peaceful, has now been hijacked by armed militants who are financed and armed by Saudi Arabia via Lebanon, Jordan, and Turkey. 1: No UNSC resolution authorizing a regime change in Syria. 2. No UNSC resolution authorizing military intervention in Syria. 3. No UNSC resolution banning arms sale to Syria. 4. No UNSC resolution condemning the Syrian regime’s violence without condemning the violence perpetrated by the armed groups. These are Russia’s red lines. Kremlin leaders are convinced that Saudi Arabia is arming ultra-conservative groups and funneling money and weapons into Syria through its borders with Lebanon, Jordan, and Turkey. Some observers have concluded that Russia has already signaled to Assad that he should use military force to clear the towns. On Tuesday, the Russian Foreign Minister Sergei Lavrov and the head of the Russian foreign intelligence visited Assad to show their support. They insisted that armed groups should be held responsible for the violence against civilians and government security forces. The U.S. on the other hand, is mulling the idea of arming opposition groups. On Tuesday, John McCain, ranking member on the Senate Armed Services Committee said that “we should start considering all options, including arming the opposition.” The Obama administration is “not considering that step right now,” according to White House spokesman Jay Carney. Instead, the administration is “exploring the possibility of providing humanitarian aid to Syrians.” Although the White House played down the suggestion, its lack of a comprehensive strategy for Syria leaves the initiative in the hands of regional powers such as Saudi Arabia–which is thought to be already arming its favorite groups. Clearly, the Syrian crisis is now turning into a regional and international turf war. The Saudis are eager to use Syria to punish Iran and deprive that emerging regional power from its most Arab ally. The United States is determined to see Iran further isolated to weaken its position ahead of the crucial nuclear talks. Russia refuses to lose its historical ally, Syria the same way the Soviet Union lost in Afghanistan. The Muslim Brotherhood-affiliated groups are becoming political opportunists. And the Syrian people are suffering as their government commences what it calls “decisive military action.” Should this conflict become more significantly militarized, and we have reasons to believe that it will be, the Syrian people’s hope for representative governance will evaporate in the heat of a bloody civil strife fueled by proxy war. The United States in particular ought to be careful pursuing a clandestine military partnership with the Saudis. The last time it did so, that partnership produced al-Qaeda in Afghanistan, the group that attacked the U.S. homeland. This time, it will either bring al-Qaeda to Syria or create a beast far more dangerous than al-Qaeda that will be able to attach many homelands at once. 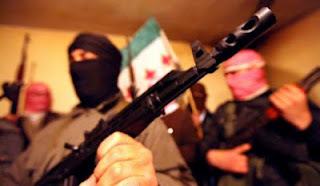 § Photos of Syrian armed groups are courtesy of al-Akhbar.